We take great pride in providing the highest quality full (4/C) color, 100% waterproof polypropelyne labels. We can reproduce your image or logo with superior quality. Our plastic labels will not disintegrate like paper labels in an ice bucket. Each order is customized to your specifications, we ask that you contact us at (325) 690-1550 to determine how much your order will cost. You will be be more than satisfied to find that we offer the best pricing in the industry. Sometimes you can't anticipate your needs in advance. 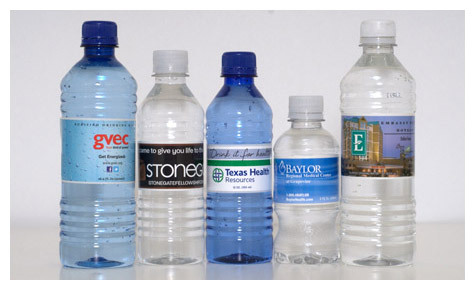 Because we design, print and bottle our water in the same facility we are able to offer rush services. Call to place a rush order now, (325) 690-1550. In order to make your experience as pleasant and economical as possible, we offer several shipping options. It is not always possible for us to ship your private label water orders using UPS or FedEx due to the weight of water. However, we have excellent relationships with various common carriers offering the cheapest delivery methods possible. Please note it is very important for you to allow ample shipping time when placing your order.